China’s defunct Tiangong-1 space lab is crashing out of the orbit, according to space-tracking site Satview. The 8.5-tonne Tiangong-1 ("Heavenly Palace") with a Norad ID No 87820 was launched in 2011. As of 8:32 am on Tuesday, it was hovering at an altitude of about 300km above the North Pacific. What if a piece of satellite or space junk suddenly falls on your head? It’s indeed a nightmare, but can come true. The Progress module made by Russia broke up into smaller pieces followed by a disintegration in October 2016. They created a spectacle at night in the UAE after burning up like fireworks. And now, China’s defunct Tiangong-1 space lab is crashing out of the orbit, according to space-tracking site Satview. The 8.5-tonne Tiangong-1 ("Heavenly Palace") with a Norad ID No 87820 was launched in 2011. As of 8:32 am on Tuesday, it was hovering at an altitude of about 300km above the North Pacific. Chinese astronauts used Tiangong-1 space lab measuring 12 meters in length and 3.3 metres in diameter for a series of spacecraft docking tests and visits. The space lab broke down in March 2016. Chinese officials told the UN in May 2017 that the satellite was likely to re-enter the atmosphere of the Earth between October 2017 and April 2018. However, as of October 24, the satellite was still orbiting at a high altitude (300km, which varies depending on which part of the globe it floats over). According to the tracking site SatFlare, Tiangong-1 wasn't expected to come down immediately. Popular astrophysicist Dr Jonathan McDowell, who works at the Harvard-Smithsonian Center for Astrophysics, confirmed in a tweet that the Tiangong-1 doesn’t pose any threat to us. Dr McDowell says there's nothing to fear about Tiangong-1 which is about to fall. "It's big, but our planet is bigger," he twitted on October 20. China will monitor Tiangong-1’s descent and will post its orbital status on the China Manned Space Agency website. China’s space agency said it will issue an "early warning in a timely manner" by informing the UN Office for Outer Space Affairs and the world body's secretary general once it obtains a final forecast for the time and region of re-entry. According to satview.com, four more satellites are hovering and are about to burn up and fall on Earth between October 26 and November 13, 2017. On March 30, 2017, a piece of fabric shield – the ISS DEB also known as 1998-067BA or NORAD 31928, was lost in space from the International Space Station. The fabric shield needed for ISS was accidently lost by NASA astronauts during a spacewalk. This fabric shield is expected to re-enter Earth’s atmosphere at about 5.20am UTC (9:30 am in Dubai) on October 26. "Firely" is expected to fall on November 1, at 11.05 UTC (3.05pm in Dubai); Flock 2E'-4 is expected on November 13, at 22h47 (2.47am in Dubai, on November 14); and CZ-4B DEB on November 14 at 16h27 (8.27pm in Dubai). According to McDowell, the risk of any damage or injury to Earth’s inhabitant is “very low” because most of it will burn up before it touches down on Earth. "Very low", says Dr McDowell, since most of it will burn up in the atmosphere as it falls. He confirmed that Tiangong-1 has started dropping more quickly as it reaches denser parts of the Earth's atmosphere. He said that pieces of up to 100 kilograms of the Tiangong-1 could come crashing down on the surface of the Earth. In terms of size, Tiangong-1 is similar to other objects that fell to Earth in 2012 and 2015. But it is just a fraction of the size of NASA’s Skylab space station weighing 77-tonee, which went down in July 1979 and fell on southeast of Perth, in western Australia. There are numerous disabled satellites hovering around in space. 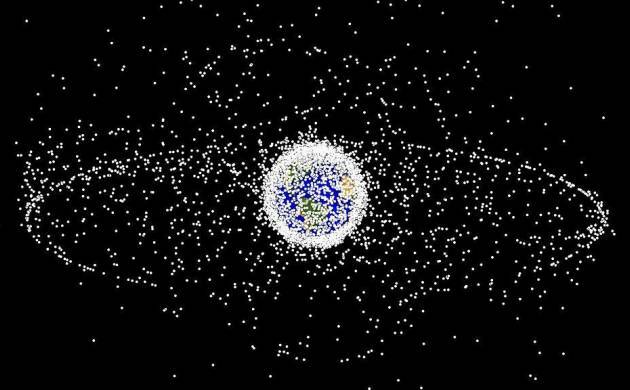 According to experts, there are tens of thousands of pieces of space junk more than 10cm in size moving up t0 30,000 kph. More than 500,000 pieces larger than a marble and several million smaller ones are present in space. These space junk are moving so fast that they could burn a hole in satellites or could even end up breaking the window of the International Space Station. According to experts, several conditions must be met in order to observe a satellite burn-up. To observe it directly, the sunshine must reach its structure and reflect into the people observing on Earth. According to SatView, for observing a burn-up, following factors must be present – all at the same time. 1. It should be observed during the night time only, when the sky is dark. 2. The height of the Sun (or the "solar disk") should be between 10 and 25 degrees below the line of the horizon. 3. The sun rays should reach the satellite directly. 4. The satellite should be at least 25 degrees above the horizon. Nasa's Skylab space: 77 tonnes (went down in 1979). Russia's Mir space station: 130 tonnes (went down in 2001).